BERLIN — Arianespace launched the next four Galileo satellites into orbit today, bringing the European Union a step closer to completing its own global navigation satellite system (GNSS). The launch, which occurred at 7:25 a.m. Eastern on July 25 from the Guiana Space Centre in Kourou, French Guiana, is the fourth for Arianespace this year, and the final flight for the “Evolution Storable” version of its Ariane 5 rocket. The 715-kilogram satellites, the last of Galileo’s “Batch 2,” were deployed into a 23,000-kilometer medium-Earth orbit approximately four hours after liftoff. With today’s deployment, the total number of satellites in the constellation is now 26, though not all are operational. Managed by the European Commission, under a contract with the European Space Agency, the Galileo program is expected to cost EU member states a total of 10 billion euros through 2020. Galileo managers still expect the system to reach full operational capability in 2020, Paul Verhoef, the European Space Agency’s director of navigation, told reporters in a July 24 call. Galileo’s coverage will be complete when there are 24 active satellites, though the constellation eventually needs approximately six more reserve satellites for backup. The network is designed so that four satellites will be available to provide a signal from any given place in the world. Currently if four Galileo satellites are available to provide a signal, the system’s accuracy is better than one meter. Of the 26 Galileo satellites that have launched, only 14 are currently operating. The four satellites put into orbit during the last launch, in December 2017, are still in their testing phase, and four that launched today will only come online in January or February 2019, said Rodrigo da Costa, the European GNSS Agency’s Galileo service program manager. One of the Galileo satellites in orbit had suffered major failure on its navigation antennae and is not in use. Another is in non-active spare mode but can be switched on again. Two more satellites that were put into a wayward orbit during a launch in 2014 with a Soyuz rocket are still undergoing analysis but are expected to eventually be brought into the constellation, Da Costa told reporters. Galileo’s initial services started in 2016, providing an open service to the cellphone market, a military-grade service, and a search-and-rescue service. Though there are still gaps in the fleet’s coverage, the satellites can be incorporated with other systems like U.S. GPS and the Russian Glonass network, and more consumers are likely using Galileo signals on their devices. “Today we have 17 smartphone brands that are integrating Galileo,” da Costa said, adding that companies including Apple, Sony, Google and Samsung are using Galileo-enabled chipsets in their most recent models. He said that data from the end of 2017 showed that 186 million Galileo-enabled smarphones have been produced and shipped. “We have very good reason to believe that today…simply on the cellphone market, there are well beyond 100 million users out there,” da Costa said. Verhoef added that they expect “an enormous boost in use” when more dual-frequency chipsets come onto the market. Today’s launch comes amid heated political debate over the United Kingdom’s post-Brexit involvement with the Galileo program, especially regarding the U.K.’s continued access to the Public Regulated Service (PRS), the military-grade signal. Unless an agreement is reached, the U.K. will be excluded from competing for new Galileo contracts and will be shut out of the system’s classified information. U.K. officials have said that they may seek to build their own alternative satellite navigation system, perhaps with a partner such as Australia. “Today, as we don’t have a clear legal certainty, which will come once the withdrawal agreement with the U.K. is agreed, the commission’s responsibility is to prepare for all possible outcomes in order to insure the stability, the security and the integrity of the Galileo program,” said Catherine Kavvada, the European Commission’s head of applications, security and international cooperation unit for Galileo and its precursor, the European Geostationary Navigation Overlay Service. The U.K.-based company Surrey Satellite Technology Limited, a subsidiary of Airbus, has built Galileo’s navigation payload, and will continue to be the provider for the next 12 “Batch 3” satellites, the first two of which are expected to launch at the end of 2020. Because the contract for Batch 3 was awarded before Brexit, only minor adjustments need to be prepared for the U.K.’s withdrawal from the EU, such as transferring a few activities dealing with classified information to the continent, Verhoef said. “The real issue for Brexit is more in relation to any future contracts, where the situation is a bit more complicated,” Verhoef said. Verhoef said that the contracts for the Batch 4 satellites will be signed at the end of 2019. Bremen, Germany-based OHB Systems AG, which built the satellites that launched today, will continue to be the prime contractor for the Batch 3 satellites. 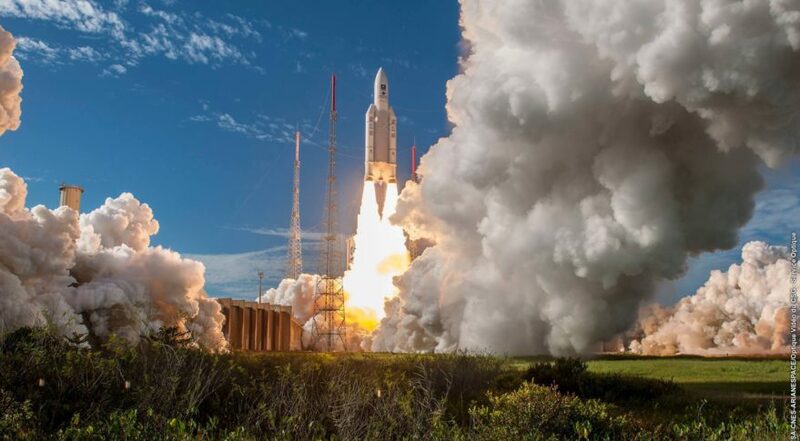 Today’s launch was the third time an Ariane 5 rocket was used for a Galileo mission. 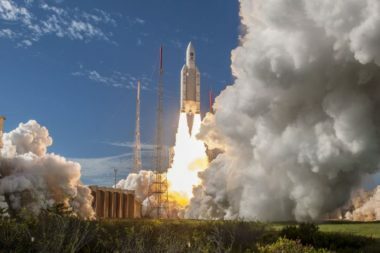 Arianespace is under contract to launch the first two pairs of Batch 3 satellites using its next-generation Ariane 6 rocket, in 2020 and 2021.